2013 College Blitz - Can they score? 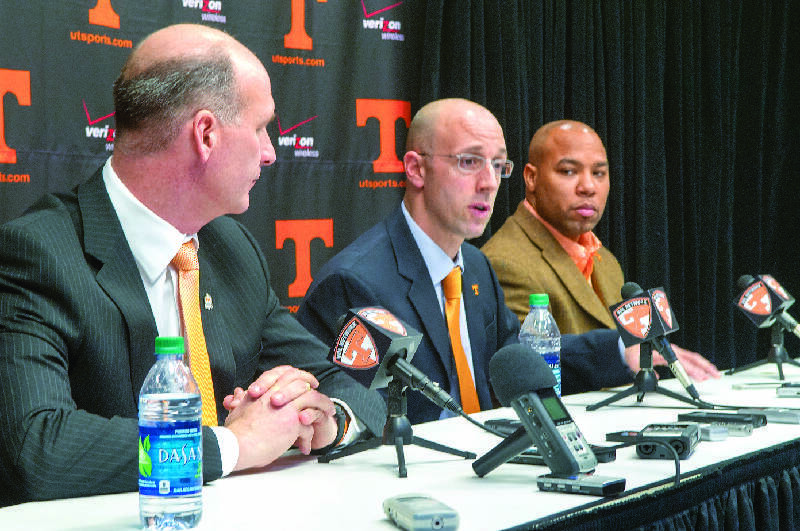 Tennessee offensive coordinator Mike Bajakian, center, knows finding playmakers is job No. 1 for his troops. Photo by Patrick Smith /Times Free Press. KNOXVILLE -- Long before Mike Bajakian was drawing up formations and calling plays for college offenses, he was drawing equations on chalkboards and grading tests. Yep, Tennessee's offensive coordinator was once a high school math teacher. And whether the Volunteers' quarterbacks are watching film with Bajakian in their meeting room or listening to him on the practice field, they know that class is in session. "He's always keeping us thinking and on our toes," junior Justin Worley said. "He's had us teaching as much as he is and is always challenging us." Bajakian, or "Coach Jake" to many of his players, was an all-conference quarterback at Division III Williams College in Massachusetts, but he said he realized "at a very young age" his dream of playing in the NFL was unrealistic and unreachable. "Ever since I was in high school and realized my playing days were going to numbered, I knew I wanted to remain in the game, and to do so would have to go into coaching," he said. "Even in high school, I always thought I'd do so as a teacher and a coach, so all through college I anticipated that when I was done playing, and having graduated, I would become a teacher." Though he majored in history, Bajakian taught a variety of math classes, from algebra and geometry to trigonometry and pre-calculus, at the Delbarton School in Morristown, N.J., less than an hour east of New York City and 40 miles northwest of his hometown of River Vale, N.J. He also coached multiple sports at the school. "I coached football and baseball, and I'll leave it at that," he said smiling. "There's some other dirt I'll leave uncovered -- how about that? -- in my coaching profession." His players, though, know the secret. "I don't know if he's told you guys, but he was his high school team's bowling coach," said Peterman, the redshirt freshman Bajakian and Vols' coach Butch Jones heavily recruited while at Cincinnati. "He didn't know anything about bowling. He can coach anything." Added Worley: "I don't think he'd be the first person to tell you that." Yet Bajakian knew he ultimately wanted to coach in college. "I loved teaching," he said. "I really enjoyed myself. I liked the kids. I liked mentoring kids that age, but I was a teacher first and a coach second, and I didn't like that part of it." So he applied for a couple of jobs and "by pure luck," he said, landed a graduate assistant position at Rutgers in 1998. He helped coach defensive back for the Scarlet Knights for two years before moving on to Sacred Heart, then to Michigan In 2001 as a graduate assistant who assisted the Wolverines' quarterbacks for two seasons. "He's told us all the stories," Peterman said. "Coach Jake cares about us more than a football player, but as an actual person. He wants to get to know us and us to get to know him on that personal level." He handled quarterbacks at Central Michigan while Jones was the Chippewas' offensive coordinator in 2002-03 before landing a quality control post with the Chicago Bears. He reunited with Jones as his offensive coordinator at Central Michigan in 2007, followed him to Cincinnati in 2010 and then to Tennessee. In six years under Jones, Bajakian has orchestrated an up-tempo version of the spread offense that's averaged 27 or more points every year, and only once in that span has a Bajakian-led offense averaged less than 400 yards per game. "Two of the most valuable experiences I've had in coaching have been, No. 1, the time that I spent in the classroom teaching math, and No. 2, the time I spent as a graduate assistant on the defensive side of the ball at Rutgers," Bajakian said. "I've often said, 'If you can keep guys interested in algebra, then teaching them football should be pretty easy.' Along those same lines, my experience on the defensive side has helped me in game planning and teaching the quarterbacks what they're seeing and what they're expecting." The Vols' quarterbacks now know they can expect frequent tests from their coordinator. "We do a drill, our progression drill, where he'll give us equations while we're dropping and see which progression that is in our drop," Peterman said. "I think something great about Coach Jake is he can coach anything. I think it just goes back to his personality and the way he approaches things with attention to detail and getting the best out of people."